The gem of all portables. Compared to the clatter and chatter of some earlier typewriters, this machine speaks in a whisper. 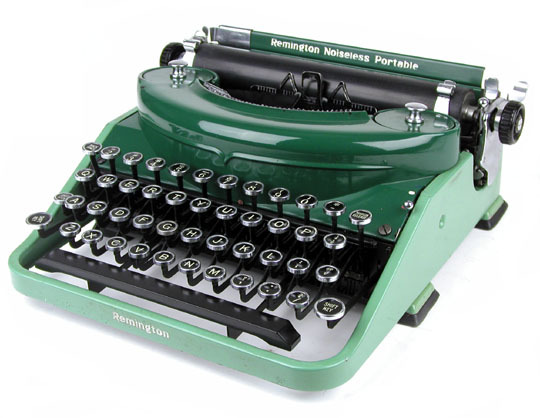 The Remington Noiseless Portable combines the new Remington speed writing mechanism with noiseless operation plus many standard machine conveniences -- yet it's portable at less than 16 pounds. Workers and writers of the day appreciated this machine for its fast, effortless typing, and especially the luxury of quiet operation. Another feature of the machine accentuated in its advertisements was its suitability for students to use while in study halls and university libraries. These are new hard-to-find original old style nylon ribbons designed for use on most Remington and Underwood Noiseless typewriters.